Summary : This is a healthy and caffeine free rooibos tea that is also quite flavorful. While not nearly as "tropical" as I was expecting, this tea does have tropical notes to its flavor which goes quite well with the rooibos tea leaves. 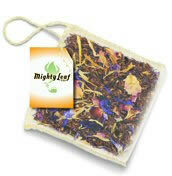 Review : Mighty Leaf teas are fast becoming one of my favorite bagged teas. I suspect the reason for this is because the tea pouches the Mightly Leaf teas come in are hardly your typical "tea bag." Instead, they are huge pouches that basically contain loose-leaf true...not the left-overs. As such, the tea leaves are very high quality and, due to their large size, produce a splendid and strong flavor not found in most other bagged teas. Since I hadn't had a rooibos tea in a while, and I was in the mood for something "different" tonight, I picked through my samplers and found a rooibos tea from Mighty Leaf I hadn't yet tried...a tea called African Nectar. Here is how Mighty Leaf describes this tea : "Sojourn to the fertile tropics with our African Nectar tea and savor the fruits of the "Alluring Continent." Made with African Rooibos leaves, this Mighty Leaf signature blend is teeming with tropical fruit and blossoms. Rich in anti-oxidants, it promotes calm and relaxation." This tea contains the following ingredients : Rooibos leaves, natural tropical flavors, natural flavors, hibiscus flowers, rose petals, mallow blossoms, marigold flowers. For a rooibos tea...which normally has a pretty subdued and less than inspiring fragrance...this tea packed quite the aromatic punch. The tea most definitely has a strong "tropical" fragrance to it...making for a welcome treat compared to the usual boring fragrance of straight rooibos teas. The flavor of this was also excellent. The flavor is tough to describe, admittedly. You'll most definitely experience the rooibos tea flavor in the tea...as it is quite strong. Yet this rooibos flavor is nicely blended in with various tropical flavors...and no one particular tropical flavor really sticks out. In many ways, the tropical flavors reminded me of a tropical flower garden, as the tea has a slight flowery flavor to it...although the flowery flavor is not nearly as strong as is found in a good jasmine tea. Rooibos teas don't get bitter...so there is no bitterness to worry about in the tea, regardless of how long your brew the tea for. The after-taste of this tea is also very pleasant, and quite long-lasting. Once again, the flavor of the after-taste is this peculiar mix of rooibos tea leaves and the various tropical flavors found in the tea. Overall, if you are searching for a bagged rooibos tea that is pleasant to drink and has a nice, unique flavor to it... this rooibos tea from Mighty Leaf is a good tea to try. Recommendation : Yes. This tea nicely combines various tropical flavors/flowers with the traditional rooibos tea leaf flavor. The result is a very pleasant and rather unique flavor that is simply best tried and not described. Brewing Instructions : Pour boiling water over tea bag. Let brew 5 minutes. You can't overbrew this tea, by the way, so if you want a stronger tea, let it brew for a few additional minutes.